A very valuable oil, for watches and fine machinery, is obtained from the blubber of the “blackfish”—which is really not a fish, but a species of small whale, attaining a length of 30 feet and weighing three tons or more. THE average person, hearing of a “blackfish,” imagines it to be an ordinary fish, about the size of a herring. But there are many fish called “black-fish” and one of them (sometimes called the “pilot-whale”) is not a fish at all, but a mammal (a species of small whale). A full-grown blackfish averages 30 feet in length and weighs about 3 tons. The blackfish travel in schools, as many as 2,000 having been seen in one school, although usually a school averages about 100 fish. During the season from July until October, the blackfish go into harbors in search of food and, if the tide happens to go out while the fish are in the harbor, they sometimes get into a natural fish-trap and are left stranded high and dry on the sand flats. Because the blubber of the blackfish produces the finest grade of oil on the market, oil manufacturers have watch-out groups of fishermen, who are familiar with the habits of the blackfish and, during these months, are on the lookout for just such happenings as above described. 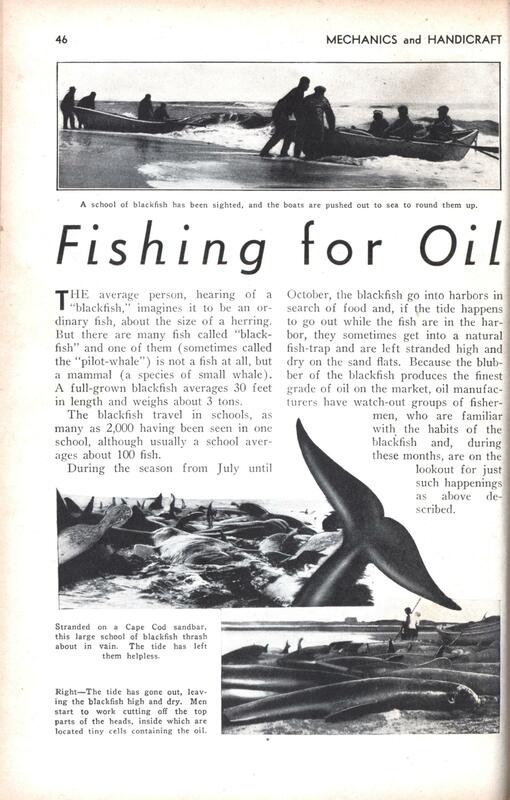 When a school of blackfish is stranded, the fishermen immediately go out on the sand flats where they are floundering, to lance them; after which the fishermen begin cutting off the tops of the heads, or “blubber caps,” which contain this very fine grade of oil. The quality of oil depends greatly on the freshness of the blubber, so they must work fast before the carcass begins to deteriorate. In the meantime the oil manufacturer is notified and trucks are sent to the scene of the cutting-up, to carry the blubber to the refinery promptly. Only the top of the head of each blackfish is considered worthwhile. Therefore, after these caps are removed from the blackfish, the carcass must be disposed of, for one can imagine how offensive a single decomposing blackfish would be—to say nothing of a whole school of them. The workmen dig a large pit, on the shore, from ten to fifteen feet deep. Each carcass is dragged to the pit by caterpillar tractors (sometimes teams of horses are used in the hauling). When all the carcasses are in the pit, they are covered over with dirt. When the “blubber caps” arrive at the refining plant, the men begin at once preparing them for the try-pots. These men have to be efficient in this particular line, for good oil depends greatly on knowing just where to cut the blubber, and to reject just those portions that would not produce good oil. They call this process “making bible leaves,” as the blub- ber must be cut into very thin slices. This is important because a small piece of blubber, if examined through a microscope, would show thousands of tiny cells, each cell containing oil; therefore, the blubber must be cut fine so as to cut into as many of the cells as possible; then, when the minced blubber it put into the try-pots, all the oil will be extracted. The try-pots are steam-jacketed kettles and the blubber is tried very slowly, in order not to burn the oil and, also, to give the oil ample time to seep from the blubber. After removing from the try – pots, further refining takes place. Three years elapse before the process is finally completed, during which there is a 50% loss. This long and careful process of refining is to give the oil long life. Machinery, when lubricated with this fine-grade oil, will function properly whether in frigid conditions or in the most intense heat of a tropical zone. The following incident is interesting: a torpedo was sunk deep in mud for several months. Mud and water soaked into the casing and, when drawn to the surface, the torpedo was found to be badly rusted, except the gyro gear, which had been so protected by blackfish oil that it had not rusted in the least. The cap of a full-grown blackfish will produce four gallons of oil. On the other hand, if all the blubber of a full-grown blackfish were tried out, it would yield one hundred and twenty-five gallons of oil—yet, after the final refinement, this would produce only four gallons of fine-grade oil. This exclusive story was obtained from Mr. Howard Wordell, manager of the Nye Oil Works, of New Bedford, Mass. Ahh the good old days when you could take game for fun and profit… I do wonder, who and how , came up with a three year long process for refining whale oil, and at a 50% reduction. Why name a whale Black Fish??? When I read these and other articles it reminds me, despite all the bad PR the petroleum industry gets, just how many even worse things Petroleum has replaced. The Industrial Revolution couldn’t have run if it weren’t for lubricants. 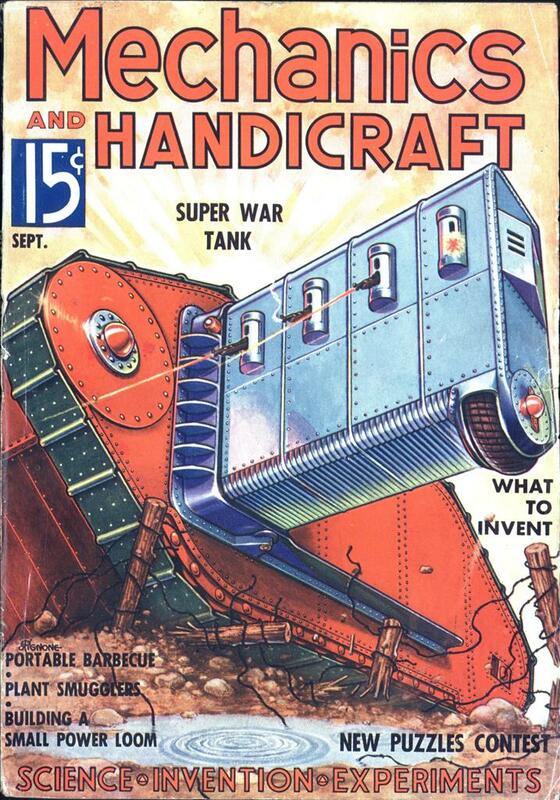 Before WWII, most things that today are synthetic or oil based were derived from living things. We were more “connected” to nature in years past in ways that most people can’t conceive today. Gaskets were made of leather, and bearings were smeared with pig fat, in addition to the whale oil and spermaceti machine lubricants mentioned here. Bits that today are plastic, were made of bone, ivory, or horn then. And of course, lower-quality whale oil was used for lamplight. Say what you will about the technology then — at least it was renewable. @Bill Thompson – I’m not sure if I agree with your definition of renewable. Look what happened to the whales, for the most part. Granted, if you harvested the whales carefully and allowed them to breed sufficiently fast, you might have a point. But nobody every farmed whales in Nebraska. PS: Please don’t suggest this to Monsanto, anyone.